I am not an authority on economics. I am, however, a person who watches what goes on around me and sometimes learns lessons from what I see. Some economic principles are obvious enough to be learned that way. In 2013, Forbes Magazine posted an article quoting a statement by then-President Obama on the subject of economic freedom. Economic freedom was not something President Obama believed in. President Obama acted on his belief that economic freedom was not a good thing, and the American economy suffered during his presidency. there is a certain crowd in Washington who, for the last few decades, have said, let’s respond to this economic challenge with the same old tune. “The market will take care of everything,” they tell us. If we just cut more regulations and cut more taxes–especially for the wealthy–our economy will grow stronger. Sure, they say, there will be winners and losers. But if the winners do really well, then jobs and prosperity will eventually trickle down to everybody else. And, they argue, even if prosperity doesn’t trickle down, well, that’s the price of liberty. Now, it’s a simple theory. And we have to admit, it’s one that speaks to our rugged individualism and our healthy skepticism of too much government. That’s in America’s DNA. And that theory fits well on a bumper sticker. (Laughter.) But here’s the problem: It doesn’t work. It has never worked. (Applause.) It didn’t work when it was tried in the decade before the Great Depression. It’s not what led to the incredible postwar booms of the ’50s and ’60s. And it didn’t work when we tried it during the last decade. (Applause.) I mean, understand, it’s not as if we haven’t tried this theory. Well, have we tried this theory? A little history is in order here. I pick 100 years deliberately, because it was exactly 100 years ago that a gigantic anti-capitalist measure was put into effect: the Federal Reserve System. For 100 years, government, not the free market, has controlled money and banking. How’s that worked out? How’s the value of the dollar held up since 1913? Is it worth one-fiftieth of its value then or only one one-hundredth? You be the judge. How did the dollar hold up over the 100 years before this government take-over of money and banking? It actually gained slightly in value. Laissez-faire hasn’t existed since the Sherman Antitrust Act of 1890. That was the first of a plethora of government crimes against the free market. …Obama absurdly suggests that timid, half-hearted, compromisers, like George W. Bush, installed laissez-faire capitalism–on the grounds that they tinkered with one or two regulations (Glass-Steagall) and marginal tax rates–while blanking out the fact that under the Bush administration, government spending ballooned, growing much faster than under Clinton, and 50,000 new regulations were added to the Federal Register. The philosophy of individualism and the politics of laissez-faire would mean government spending of about one-tenth its present level. It would also mean an end to all regulatory agencies: no SEC, FDA, NLRB, FAA, OSHA, EPA, FTC, ATF, CFTC, FHA, FCC–to name just some of the better known of the 430 agencies listed in the federal register. Even you, dear reader, are probably wondering how on earth anyone could challenge things like Social Security, government schools, and the FDA. But that’s not the point. The point is: these statist, anti-capitalist programs exist and have existed for about a century. The point is: Obama is pretending that the Progressive Era, the New Deal, and the Great Society were repealed, so that he can blame the financial crisis on capitalism. He’s pretending that George Bush was George Washington. Please follow the link to read the entire article. It accidentally explains the reasons the economy has prospered under President Trump. I also strongly recommend reading The Creature From Jekyll Island by G. Edward Griffin for the story behind the creation of the Federal Reserve System. The 2-year spending bill has passed. The good news is that we will now be able to go two years without the threat of a government shutdown. The bad news is that in order to get the needed military spending and pass the bill, fiscal sanity went out the window. However, when you look at the bigger picture of where we are currently, things are actually getting better. The Gateway Pundit posted an article today about the Trump Administration and debt increases. In spite of the fact that President Trump took over with nearly $20 trillion of debt and the related interest payments on the debt, and in spite of the Federal Reserve (FED) under Janet Yellen increasing interest rates by a full 1 percent since the 2016 election, President Donald Trump’s debt is one third and $1.2 trillion less than Obama’s. The US Debt since President Trump was inaugurated on January 20th, 2016 through today has increased by only $547 billion. On inauguration day the debt was at $19.9 trillion and on February 7th, 2018 the debt stood at $20.5 trillion. …Where President Trump increased the Debt to date by only 2.7% , Obama increased the debt by 16.2% or 13.5% more than President Trump. President Obama inherited a US Debt amount of $10.6 trillion on his inauguration and increased it by more than $1.7 trillion by the end of his first year in office. …CNBC reported in December 2015 that President Obama oversaw “seven years of the most accommodative monetary policy in U.S. history” (from the Fed). The Fed Funds rate was at zero for most of Obama’s time in office. Finally, in December 2015 the Fed announced its first increase in the Fed Funds rate during the Obama Presidency. The only Fed Funds Rate increases since 2015 were after President Trump was elected President. The Fed increased the Fed Funds Rate on December 14, 2016, March 15th, 2017, June 14, 2017 and again on December 13, 2017. Four times the Fed has increased rates on President Trump after doing so only once on President Obama late in his 2nd term. Lower interest rates usually spur the economy by making corporate and consumer borrowing easier. Higher interest rates are intended to slow down the economy by making borrowing harder. If the Federal Reserve was political and wanted to prevent Republican Presidents from successful economic growth and debt decreases, then the Fed would increase the Fed Funds rates during Republican Presidents’ terms while decreasing the Fed Funds rates under Democratic Presidents’ terms. This appears to be exactly what the Fed is doing and the market is reacting negatively this past week because of it..
One of the things to remember during the Trump Administration is that President Trump is truly swimming upstream. There are a lot of vested interests in Washington who feel that the success of President Trump would not be in their best interest. Among other things, shrinking the size of the bureaucracy would have a negative impact on real estate prices in the suburbs surrounding Washington–currently the wealthiest counties in the nation. President Trump is a serious threat to the deep state. Yesterday The Washington Free Beacon posted an article about the impact of corporate tax rates on entrepreneurship. The article notes that as the corporate tax rate increases, the number of start-up companies decreases. Entrepreneurship is negatively impacted by higher corporate tax rates, according to a study from the Federal Reserve. The study looked at counties that had changes to their state corporate, personal, or sales tax rates and how entrepreneurial activity was affected compared with those counties that had no changes to tax rates. The study defines entrepreneurs and startups as those that are two years old or younger. The study also points to previous research that finds self-employment is affected by how complex the tax code is. Corporate tax rates reduce research and development and new product development. If this study is accurate, we are going to have substantial economic growth in America as the corporate tax cut begins to take effect. Like him or not, President Trump is a businessman, and a rather successful one. I suspect he was already aware of the relationship between corporate taxes and start-up companies. Just for the record, I was talking to someone last night who has been a Trump supporter since he announced his candidacy. She said something to me that I think is very astute–“Trump had to be the candidate–we needed a mud wrestler to fight the Democrats. The other Republican candidates wouldn’t do it.” That is an amazing (and true) statement. So How Did The Federal Debt Do This Year? President Trump is a businessman. Regardless of whether you like him or not, he is a businessman, and successful businessmen are relatively careful about how they spend money, and how much money they spend. President Trump is no exception. Yesterday The Gateway Pundit posted an article about the impact of the Trump Presidency on the debt. In spite of the fact that President Trump took over with nearly $20 trillion of debt and the related interest payments on the debt, and in spite of the federal reserve (fed) under Janet Yellen increasing interest rates by a full 1 percent since the election, President Donald Trump’s first year debt is $1.1 trillion less than Obama’s. Right after Barack Obama was elected President, on December 16, 2008, the Federal Reserve (The Fed) lowered the Fed Funds rate by an entire percent, from 1% down to 0% . The Fed had not lowered the Fed Funds rate by such a large amount (1% ) since at least before 1990, if ever. The Fed kept this 0% rate for most of Obama’s eight years in office. CNBC reported in December 2015 that President Obama oversaw “seven years of the most accommodative monetary policy in U.S. history” (from the Fed). The Fed Funds rate was at zero for most of Obama’s time in office. Finally, in December 2015 after the Fed announced its first increase in the Fed Funds rate during the Obama Presidency. The only Fed Funds Rate increases since 2015 were after President Trump was elected President. The Fed increased the Fed Funds Rate on December 14, 2016, March 15th, 2017, June 14, 2017 and again on December 13, 2017. Four times the Fed has increased rates on President Trump after doing so only once on President Obama. If the Federal Reserve was political and wanted to prevent Republican Presidents from successful economic growth and debt decreases, then the Fed would increase the Fed Funds rates during Republican Presidents’ terms while decreasing the Fed Funds rates under Democratic Presidents’ terms. This appears to be exactly what the Fed is doing. The article at The Gateway Pundit also notes that without the increases in the interest rate it is possible that President Trump would have a balanced budget to date. Remember that the Federal Reserve is neither Federal nor a Reserve. It is a stranglehold on our economy held by a small group of extremely wealthy people who control our money supply. For those who are interested in learning exactly how we got the Federal Reserve, I strongly recommend reading The Creature from Jekyll Island by G. Edward Griffin. It explains the chicanery that was involved in creating the Federal Reserve and how it was sold to the American people. In 1910 a group of political, industrial, and financial leaders met in secret on Jekyll Island in Georgia to lay the foundation for the Federal Reserve. The people in attendance included Nelson W. Aldrich, Republic Whip in the Senate, Abraham Piatt Andrew, Assistant Secretary of the U.S. Treasure, Frank A. Vanderlip, president of the National City Bank of New York (representing William Rockefeller), Henry P. Davison, senior partner of the J.P. Morgan Company, Benjamin Strong, head of J.P. Morgan’s Bankers Trust Company, and Paul M. Warburg (partner in Kuhn, Loeb & Company, a representative of the Rothschild banking dynasty in England and France). (This information is from The Creature from Jekyll Island by G. Edward Griffin.) This meeting set up the cartel we now know as the Federal Reserve. It is a cartel because it is a small group of people not accountable to the government who control the flood of money in America. They have traditionally used that power politically and will continue to do that in the future. Although some members of Congress have called for a thorough audit of the Federal Reserve, but because of the power the fed has, that will never happen. Yesterday The Gateway Pundit posted a story about recent actions by the Federal Reserve. During the eight years of the Obama Administration, President Obama continually used executive orders to put roadblocks in the way of economic growth–over-regulation, increases taxes on successful people, and generally doing things that made it more difficult for small businesses (the backbone of our economy) to grow. During this time, the Federal Reserve kept the economy from feeling the impact of President Obama’s actions by not raising interest rates. Now we have a President who understands economics and is doing things to help the economy grow. So what is the Federal Reserve doing–trying to undercut his success. The only other Fed Funds Rate increases since 2016 were after President Trump was elected President. The Fed Funds Rate increased on December 14, 2016, on March 15th, 2017 and yesterday June 14th, 2017 by .25%. So again the question is whether the Fed is trying to negatively impact President Trump’s economic recovery from the abysmal Obama years (Obama was the only President where the GDP growth rate never broke 3%) or is the economy just so much better now that President Trump has taken office? The Federal Reserve is neither federal nor a reserve. It is the vehicle that moves money around the country. The fed controls interest rates and the money supply. There are some real questions as to whether or not the Fed accountable to anyone. In 1994, the book The Creature from Jekyll Island by G. Edward Griffin was published. The book tells the story of the creation of the Federal Reserve. It chronicles the secret journey from New Jersey to Jekyll Island (to create the federal reserve) in Senator Nelson Aldrich’s private railroad car by such luminaries as Abraham Piatt Andrew, Assistant Secretary of the U.S. Treasury, Frank A. Vanderlip, president of the National City Bank of New York, Harry P. Davison, senior partner of the J.P. Morgan Company, and Benjamin Strong, head of J.P. Morgan’s Bankers Trust Company. I strongly suggest reading the book to discover how the Federal Reserve was passed through Congress and formed. Fast forward to March 29, 2017. One America News Network is reporting that the House of Representatives Committee on Oversight and Government Reform has approved a bill to allow a congressional audit of Federal Reserve monetary policy. Democrats have uniformly spoken out against the idea. Republican President Donald Trump expressed support for audits of the U.S. central bank during his election campaign, but it remained unclear whether the White House would back the proposal. Republicans proposed numerous bills during the Obama administration to open the Fed up to deeper scrutiny, arguing the added transparency would ensure the Fed was accountable and free of outside influence. Currently, the Fed publishes detailed audits of its finances but it keeps the inner workings of its monetary policy deliberations secret, publishing transcripts of policy meetings only with a five-year lag. The proposal approved on Tuesday would “put an end to that reign of secrecy,” said Representative Thomas Massie, the Kentucky Republican who submitted the bill. The House has already passed versions of the bill twice, with dozens of Democrats joining nearly unanimous Republican support in 2012 and 2014. Those versions of the legislation died in the Senate. The article also cites the example of Representative Stephen Lynch, a Democrat from Massachusetts, who voted for similar legislation in 2012 and 2014, but spoke against the current proposal because he fears political interference at the Fed. It goes without saying that there will be a group of establishment politicians who will oppose an audit of the Fed. The Fed is another example of something put in place by politicians that has a major impact on the finances of every American, yet very few Americans know its history or how it works. It is probably one of the least transparent institutions in Washington. It is time to audit the Fed. On Sunday The Wall Street Journal posted an article about some of the recent bank settlements that were supposed to help consumers. Well, I think consumers were on the list right after political entities. Imagine if the president of the United States forced America’s biggest banks to funnel hundreds of millions—and potentially billions—of dollars to the corporations and lobbyists who supported his agenda, all while calling it “Main Street Relief.” The public outcry would rightly be deafening. Yet the Obama administration has used a similar strategy to enrich its political allies, advance leftist pet projects, and protect its legacy—and hardly anyone has noticed. The administration’s multiyear campaign against the banking industry has quietly steered money to organizations and politicians who are working to ensure liberal policy and political victories at every level of government. The conduit for this funding is the Residential Mortgage-Backed Securities Working Group, a coalition of federal and state regulators and prosecutors created in 2012 to “identify, investigate, and prosecute instances of wrongdoing” in the residential mortgage-backed securities market. In conjunction with the Justice Department, the RMBS Working Group has reached multibillion-dollar settlements with essentially every major bank in America. The most recent came in April when the Justice Department announced a $5.1 billion settlement with Goldman Sachs. In February Morgan Stanley agreed to a $3.2 billion settlement. Previous targets were Citigroup ($7 billion), J.P. Morgan Chase ($13 billion), and Bank of America, which in 2014 reached the largest civil settlement in American history at $16.65 billion. Smaller deals with other banks have also been announced. You might expect that maybe some of the money would go into the U.S. Treasury to pay off some of the deficit. Silly person. …a substantial portion is allocated to private, nonprofit organizations drawn from a federally approved list. Some groups on the list—Catholic Charities, for instance—are relatively nonpolitical. Others—La Raza, the National Urban League, the National Community Reinvestment Coalition and more—are anything but. …As part of their “consumer relief” penalties, Bank of America and J.P. Morgan Chase must also pay a minimum $75 million to Community Development Financial Institutions—taxpayer-funded groups propped up by the Obama administration as an alternative to payday lenders. “Housing Counseling Agencies” also get at least $30 million. This essentially circumvents Congress’s recent decision to cut $43 million in federal funds routed to these groups through the Department of Housing and Urban Development. The politicians who negotiate the settlements as part of the RMBS Working Group have also directed money to their supporters and states. Illinois’s Democratic attorney general Lisa Madigan announced she had secured $22.5 million from February’s Morgan Stanley deal for her state’s debt-ridden pension funds—a blatant payout to public unions. The deals with J.P. Morgan Chase, Bank of America and Citigroup yielded a further $344 million for both “consumer relief” and direct payments to pension funds. Is there any doubt that we need a new paradigm in Washington? There was no “Main Street Relief” involved in any of this–there was, however, Washington corruption. It was nothing more than a legal stick-up. The New York Post posted an article today about the Consumer Financial Protection Bureau. Newly uncovered internal memos reveal the Obama administration knowingly exaggerated charges of racial discrimination in probes of Ally Bank and other defendants in the $900 billion car-lending business as part of a “racial justice” campaign that’s looking more like a massive government extortion and shakedown operation. So far, Obama’s Consumer Financial Protection Bureau has reached more than $220 million in settlements with several auto lenders since the agency launched its anti-discrimination crusade against the industry in 2013. Several other banks are under active investigation. That’s despite the fact that the CFPB had no actual complaints of racial discrimination — it was all just based on half-baked statistics. A confidential 23-page internal report detailing CFPB’s strategy for going after lenders shows why these companies are forking over millions of dollars in restitution and fines to the government despite denying any wrongdoing. Ally Bank was willing to settle on paying $98 million rather than the $204 million the government had initially requested. Why were they willing to pay at all? The FDIC was looking at charges of ‘red lining’ at the time the suit was brought. Ally Bank needed to pass its Community Reinvestment Act exam. If the suit had not been settled, it probably would not have passed the exam. This bears a striking resemblance to a mob shakedown. Someone would come into a business and say, “You have a nice place here, it would be a shame if something bad happened to it.” Now the government is doing that. It gets worse. In fact, CFPB still has not been able to definitively ID the race of any borrower it claims Ally victimized — which is why it has taken more than two years to send remuneration checks to alleged victims. Desperate to find them, the bureau recently had to mail 420,000 letters to Ally borrowers to coax at least 235,000 into taking the money, and to allow Cordray (CFPB chief Richard Cordray) to save face. Checks started going out this month to the fictitious victims — just in time for the election. So what if some recipients are white? They will all no doubt thank Democrats for the sudden, unexpected windfall of up to $520 in the mail. When the government becomes a thug, it is time to shrink and replace the government. Who exactly was the Consumer Financial Protection Bureau set up to protect? 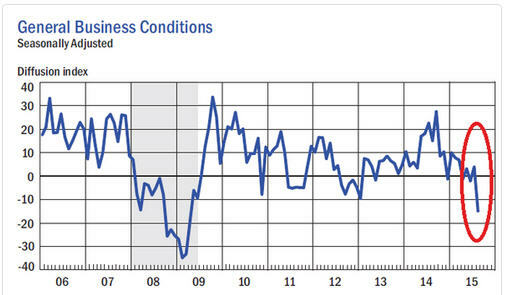 Market Watch is reporting today that New York area manufacturing conditions fell rapidly in August. The Empire State general business conditions index nose-dived to a reading of negative 14.9, from positive 3.9 in July, marking the worst level since April 2009, the New York Fed said. The index, on a scale where any positive number indicates improving conditions, was far worse than the positive 4.5 forecast in a MarketWatch-compiled economist poll. The only good news in this is that the decline may cause the Federal Reserve to delay interest increases for a while. 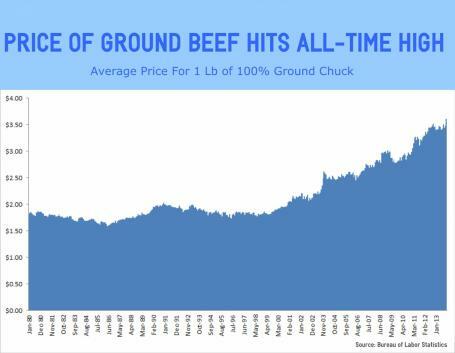 It is hard for anyone who has been in a grocery store in the past year to believe that inflation is low. From July to August, the “Core Consumer Price Index” did not move. That means zero inflation, if you use the measure of inflation the Federal Reserve uses when setting monetary policy. But core CPI omits volatile prices like food and energy. If you have a family, you’re probably pretty aware that food and utility bills are a big factor. The result: The inflation measure that guides Fed decisionmaking has little resemblance to the inflation measure that guides family budgetmaking. This is another example of the government manipulating numbers to get the desired result. Any resemblance to what is actually taking place and what the government is reporting is purely coincidental. Food at home is up 2.9 percent. Electricity is up 4.1 percent and gas bills are up 5.8 percent. Coffee is up more than 50 percent from last year. The net result is that life has gotten considerably more expensive for me since this time last year. I’m not saying this ought to guide our monetary policy. I’m just saying that core CPI doesn’t track the cost of living. Today’s Washington Examiner posted a story about Congressional Budget Office (CBO) statements on the condition of the American economy. The CBO is not optimistic about the future. The CBO updated its fiscal projections Wednesday, and they reflected its new gloomy view that the future of the U.S. economy is one of slower growth and lower productivity. The CBO first reached the conclusion that future growth will be slower when it released its long-term budget projections in July, but only incorporated it into its official 10-year budget projections Wednesday. In its new projections, the CBO sees the economy suffering from a scenario in which its potential is slightly lower than before — 1 percent lower in 2024 than previously expected. As a result of weak economic growth this year and slightly slower potential growth over the next 10 years, the CBO sees $514 billion in lost revenue. …The CBO’s scenario — slower growth and permanently lower interest rates — is consistent with the “secular stagnation” scenario outlined by former Obama economic adviser and Harvard professor Larry Summers, who has argued that the U.S. economy may not be able to generate enough consumer demand for goods and services on its own without stimulus from the Federal Reserve or through federal spending. The assumption that demand will return to normal “now seems problematic,” Stein (Center for American Progress’ Harry Stein) told the Washington Examiner, noting that he wasn’t sure whether the CBO assumed secular stagnation in its model. So how do you grow an economy? Ronald Reagan seemed to have the answer–lower taxes. If you look at the deal that President Reagan made with Congress (a Democrat-controlled Congress), Congress was going to cut spending along with the tax cuts. Unfortunately, Congress chose to ignore their part of the bargain, and spending during the Reagan years increased greatly and deficits went up despite record tax revenues coming into the government. Even with the growing deficits, the economy grew rapidly once the tax burden was taken off of the people who create jobs and produce wealth. The Obama Administration has increased the income of the wealthy while leaving the middle and lower classes behind. This is the fruit of crony capitalism. The gap between rich and poor has increased during the Obama Administration–not decreased. If you want to see America prosper again, elect people to Congress who will cut taxes and cut spending. Breitbart.com reported yesterday that there are some questions as to the amount of money Elizabeth Warren spent to set up the “Consumer Financial Protection Bureau” as a federal watchdog to prevent financial institutions from abusing U.S. consumers. The Office of Inspector General of the United States Federal Reserve (OIG) was requested by the House Financial Services Oversight and Investigations Committee on January 29, 2014, to evaluate the Consumer Financial Protection Bureau’s (CFPB) headquarters renovation costs that rose from $55 million to at least $215.8 million. It therefore appears that although Sen. Elizabeth Warren was the responsible party at the CFPB who approved the “decision to renovate,” the design, and the cost “Scope and Justification for Estimates,” all documents regarding her decisions have vanished. More missing paperwork from the Obama Administration. Someone needs to open a Lost and Found for these people. Ms. Warren was supposed to be protecting consumers from overzealous corporations, meanwhile she was exploiting the taxpayers to create her own luxurious offices. This sort of expense can be added to the list of places the federal budget could easily be cut. Investors.com posted an article today analyzing the jobs report that was released today. It is a mixed picture. The chart shows a decreasing official unemployment rate, but it also shows what the unemployment rate would be if the labor participation rate used to calculate the unemployment rate were constant. 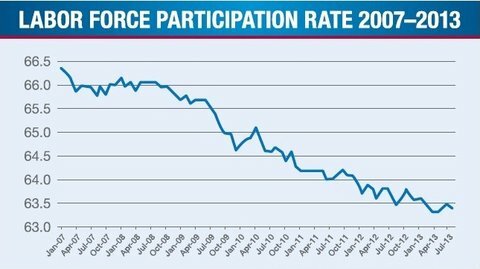 The number of people who are not currently in the labor force is extremely high. To further muddle the picture, January’s employment report showed a gain of 21,000 manufacturing jobs. Construction added 48,000 workers, the most since the recession, after a sharp weather-related drop in December. Meanwhile, retailers shed 12,900 jobs and cut the average workweek to 29.7 hours. Other unexpectedly weak data in the past few weeks include sharp drops in durable goods orders as well as new- and pending home sales. Federal Reserve policymakers noted the housing pause at their January meeting, but decided other improvements in the economy were enough to justify continuing to taper asset purchases. Hembre said the latest data shouldn’t change that outlook. At some point the Federal Reserve policymakers are going to have to taper their asset purchases. The longer they postpone that, the more of a shock it is going to be. Unfortunately, the Federal Reserve has propped up the dollar and the stock market to the point where there will not be a soft landing. Because of the financial policies of the Federal Reserve for the past ten or twelve years, we will probably experience a very bumpy landing some time in the next six months. I believe we will come through it, but I also believe it will be very bumpy. Paul Mirengoff at Power Line posted an article yesterday about the new Dodd-Frank rules regarding mortgages that will go into effect on January 10. The article points out that because Congress chose to ignore the actual cause of the problem, the new rules will not solve the problem. The article cites comments by Diane Katz of the Heritage Foundation. What were these policies? Primarily, (1) artificially low interest rates set by the Federal Reserve, (2) the massive subsidy of risky loans by Fannie Mae and Freddie Mac, (3) and the low-income lending quotas set by the Department of Housing and Urban Development. Rather than admit that the government was a major part of the problem, Congress simply directed the focus elsewhere, passed laws that will not address the problem, and continued on its way. At the heart of the new regulation is a requirement that lenders ensure that borrowers have the “ability to repay” a mortgage. Borrowers will now have the right to sue lenders for misjudging their financial fitness. Borrowers may also assert a violation of the ability-to-repay requirement as a defense against foreclosure, even if the original lender has sold the mortgage or assigned it to a servicing firm. The impact of this new scheme is obvious. As Katz says, it “will raise the costs and risks of mortgage lending” and thereby result in less credit availability. I wonder if you lie about your income on your mortgage application if you still have the right to sue. The 3,500 pages of new mortgage regulation will not guarantee that a housing bubble and collapse will not happen again. Nor can such inflexible standards possibly keep pace with the constant changes in market conditions. But it will constrain the availability of credit and increase the costs. Such a regime eviscerates the fundamental principles of a mortgage “market,” thereby punishing consumers more than protecting them. The federal government gets more power to regulate and the American people pay the price. 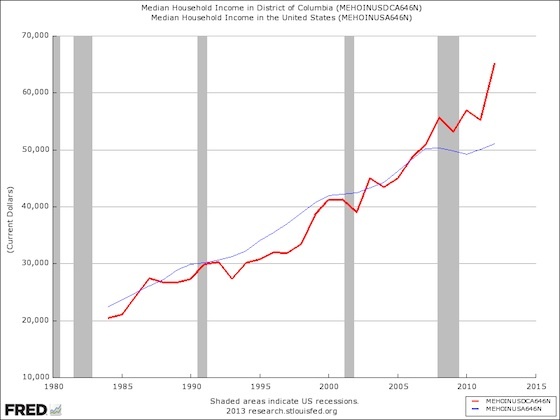 The chart above shows the median household income of the Washington, D.C., area versus the median household income of the rest of the nation. From the mid-1980s to around 2007, the median household income rise in DC remained pretty closely linked to that of the nation as a whole. Anyone remember what happened in 2007, besides the economic slowdown that would turn into the Great Recession? Democrats took control of Congress and federal spending shot upward ever since. And at least according to the Fed, that disparity is actually accelerating, at least to 2012, with DC median income skyrocketing while the rest of us stagnate. We have a choice to make as Americans. It’s not a Democrat or a Republican choice–it’s an American choice. Do we keep spending ourselves into bankruptcy or do we begin to act like adults and live within our means? The choice is ours. We have an election coming up in about a year. Forget party labels–they really aren’t worth much right now. Find out what the candidate’s position is on spending and formulating a federal budget (we haven’t had one since 2009). Find our what the candidate’s past voting record is on fiscal matters. These things are not hard to find. Thomas.gov is an excellent source of information for votes, sponsors of legislation, and actions of past Congresses. Do your homework–your country depends on it. The Stock Market reached record levels today. Normally that would be cause for celebration, but if you look at the reasons behind the rise in the stock market, the news doesn’t look quite so good. Yahoo Finance reported today that the federal government will continue putting stimulus money into the economy for the near future because the economy is not growing at a satisfactory rate. The Fed predicted Wednesday that the economy will grow just 2 percent to 2.3 percent this year, down from its previous forecast in June of 2.3 percent to 2.6 percent growth. Next year’s economic growth will be a barely healthy 3 percent, the Fed predicts. Fed officials decided to continue their $85-billion-a-month bond purchase program, surprising most economists, who had expected a slight reduction. The bond purchases have been designed to keep long-term loan rates low to encourage spending. So what has this got to do with the stock market? Financial people expected the Fed to begin to slow its bond purchases, which would have begun the rise of interest rates. Right now, with interest rates at record lows, and the possibility of inflation, the stock market is a logical place to invest. As the Fed begins to pull back from its bond purchases, the stock market will fall slightly, mortgage rates will increase, and we will probably begin to see some serious inflation. The stock market is currently being propped up by the Fed. I have not heard any good guesses as to what will happen when the Fed begins to slow down the money flow. The labor force participation rate is the lowest it has been in 34 years. The economic policies of the Obama Administration have not worked. If President Obama will not reverse them, we need to elect people who will. Our future depends on it. Newsbusters posted a story today about numbers released by the St. Louis Federal Reserve last week on unemployment fraud. Their research found $3.3 billion in fraudulent unemployment claims in 2011. Considering the media’s panic over $85 billion in supposed sequestration cuts, you would think they’d be interested in this. The only media that covered this were the Wall Street Journal on Friday and a Huffington Post on Sunday. It seems to me that this is something that American taxpayers might be interested in. Not only do we have a spending problem, we also have a dishonesty problem. Yesterday CNS News reported that the number of Americans not in the labor force grew by 169,000 in January. Meanwhile, aol.com reports that 157,000 new jobs were added in January 2013. Federal Reserve officials said on Wednesday that economic activity had “paused,” but they signaled optimism the recovery would regain speed with continued monetary policy support. The Fed left in place a monthly $85 billion bond-buying stimulus plan. Economists polled by Reuters had expected employers to add 160,000 jobs and the unemployment rate to hold steady at 7.8 percent last month. 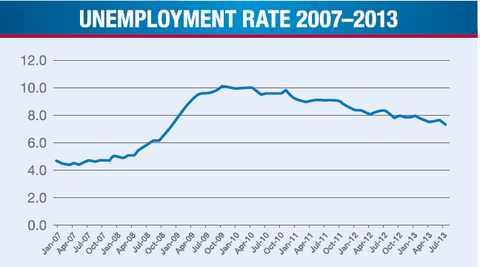 …Job growth in 2012 averaged 181,000 a month, but not enough to significantly reduce unemployment. Economists say employment gains in excess of 250,000 a month over a sustained period are needed. We are losing jobs as fast as we are gaining them. This really does not look like a strong economic recovery. CNS News is reporting today that the amount of the U. S. Government debt held by the Federal Reserve has increased by 257 percent since President Barack Obama was first inaugurated on Jan. 20, 2009, and the Fed is currently the single largest holder of U.S. government debt. Since Obama has been president, the publicly held portion of the U.S. government debt (as opposed to the “intragovernmental” debt the government has borrowed from federal trust funds such as the Social Security Trust Fund) has increased by $5,264,245,866,257.40. The $.221369 in additional U.S. government debt the Fed has purchased during Obama’s presidency equals 23 percent of all the new publicly held debt the Treasury has issued during that time. Please read that again. That paragraph refers to the fact that the government has borrowed from federal trust funds such as the Social Security Trust Fund. Remember, this is the government that is referring to Social Security as an entitlement. I don’t think I am too far off base when I say that the way the government has handled the Social Security Trust Fund should convince us that we should give the government as little of our money as possible–they did not handle money well. Unless we elect people who are willing to curb Washington’s runaway spending, our nation will be bankrupt by the time the next president takes office. Investors.com posted an article today on QE3 and the impact it will have on the American economy. The article points out that the economic problems America is currently experiencing are not due to a lack of money–their fiscal. Fed chief Ben Bernanke defends the QE program, claiming Fed studies showed it boosted GDP by 3% and led to 2 million new jobs. Even if true, the basic arithmetic is irrefutable: The Fed‘s tab for the QE program is now over $3 trillion. And most of that new money went to buy government debt — not to “stimulate” the private sector. The article points out that banks and companies are currently holding on to their money rather than spending or investing it. One reason for that is the uncertainty about future tax policy and future federal spending. We don’t mean to sound conspiratorial, but a major Fed action coming just before an election is highly suspect — particularly when the sitting president’s foe has said he would not rename Bernanke to his Fed post in January 2014, when his term in office expires. The government’s addition of $1 trillion a year to our nation’s debt hangs over this economy like a dark cloud, keeping entrepreneurs and big businesses alike on the sideline. The “fiscal cliff” we’re about to go over will sock Americans — especially entrepreneurs — with a tax hike of almost $1 trillion. That’s why the economy’s dead — not insufficient Fed money printing.